The team are in Basingstoke, where James is delighted to find an ancient artefact dating from 100BC, making it the oldest item the show has ever seen. This town has witnessed some very dramatic events over the centuries. and in 1880 there was even a riot. because today Flog It is in Basingstoke. of the English Civil War. now a ruin but once a Royalist stronghold. Oliver Cromwell's army attacked it for over two years. saw victory for the Roundheads and the house razed to the ground. in the modern heart of Basingstoke. The Anvil, so let's get the doors open, and let the drama unfold. Catherine Southon and James Lewis. and he's found something Flog It is very familiar with. everybody at home will know is an old Flog It favourite. It is of course Clarice Cliff. but this is a really interesting piece. It has everything about Art Deco that you want to see. and it just works, and I love it. What do you think to it? -Yeah, it was a family piece and we love it as well. But we're too frightened to use it. they are far too valuable for use. Tell me its family history. and Mum says she can remember using it as a child. So who has it in whose house? -Mum has it in her house. -OK, so you don't own it? -No, we're here on her behalf. Well, I think she obviously had very, very good taste. -Do you know the pattern name? and it was well known as being Clarice Cliff's favourite pattern. The very common versions are in various tones of green and blue. and this was produced from 1932 onwards. of oxidation on the blue there, that's common, you often found that. Devalues it slightly but it's not a massive problem. Having said all that, what do you think it's worth? -I know Clarice Cliff is popular but we really have no idea. I would put an auction estimate of £300 to £500. Having said that, we need to protect it with a reserve. If we put £300 on it, I'm sure it will sell. -The market is so buoyant for it. I'm 100% confident it will sell. Caroline, welcome to Flog It. because it's something that my grandfather has. almost mint and certainly boxed. that's all I can say, really. They bought it for a present, birthday present, Christmas present, something like that. especially because it's got lots of little fiddly bits to touch. and then the wings would fly out. -I just find that amazing that he just wouldn't touch it. lots of bits would be broken off. Is it something that you like? so we just thought that would be one that would go, really. -Did you ever see the film? -Yes, quite a few times. Oh, right, so you're big Chitty Chitty Bang Bang fans. and they're all having a little wave and great fun in the car. do you have any idea of how much this would be worth at auction? -but then that was a long time ago. although that does seem a bit unfair considering it is in immaculate condition. -..with a fixed reserve of £80. -Yes. Yes, fine, that's lovely. -But I hope it makes the top end and flies away at auction. Keith, tell me a bit about the clock. but it's been staying with my other grandmother in her house, which is a bungalow. so we haven't got anywhere to store it. and it's made by James Fell, and it's Kendall. a subsidiary dial with a second hand. The great thing about it is it's an 8-day longcase. by the two winding movements. If it was a 30-hour clock you'd just have the one winding movement. ..on its own without being wound. -Yes, one wind on the seventh or eighth day. -I was curious about what that meant. Oh, it's lovely, it's a classic case. -It's nice and narrow, it's not too tall. but what I would like to take the hood off and have a look at the movement. -You hold the trunk and I'll slide the hood out. -I should put that on the floor. -but we've got that bit down there, haven't we? You've got the weights, pendulum, and winder, that's good. -And that actually sits nicely on the shoulders of the trunk. So that's a good indication as well. to make a base for this to sit on, you can see that. -It's so easy to tell and you can see the wear marks here. -Over the years, where that's just been dropped into place. That's another good thing to look for, wear. ..that's holding this up, so we know the clock is 100% right. It's a shame we can't get the little flywheel to tick over and hammer the bell. and that will cost around about £300. and touch up the door there. But that's what you're looking for for a bit of restoration. Had you thought about price? -I was thinking 500, maybe 600, at auction. -And then it's for the dealer to restore. -I think you're spot on. -If it goes for that, there's commission, obviously, to pay. Then there's the restoration costs. I think there's profit in it for a dealer to buy it and sell it on. I'm fine with that, yeah. OK.
this has got to be one of the more unusual. Tell me, where did you come by it? -Winchester car boot sale a couple of years ago. -Right. How much was it? Well, I asked the gentleman behind the stall and he said 50p. obviously the person selling didn't. The thing that I love about this is everything really. just the feel of it. -I believe it's over 2,000 years old. Aromatic waters, something like that. It's the classic antique shape, isn't it? Whenever we're talking about antiquities, that's the shape we're talking about. all of them inspired from this type of thing. and you can see here where it's missed the glaze on the rim there. the quality of that and it survived, you know? Yeah, that's the amazing thing, isn't it? and here we have the earliest thing ever on Flog It and it's perfect. back down to earth. What's it worth? 50 to 70, something like that. And a reserve, I think, of £50. -Not always, no it doesn't. No. -That to somebody is a piece of history. Well, as you can see, everybody is working flat out down there. so it's time to put those experts' valuations to the test. here's a recap of what we've found so far. but will it prove just as popular with our bidders? so I'm sure it'll fetch a grown-up price. but I doubt if it'll put the buyers off. Clive's Grecian urn is 2,000 years old. At just 50p what a car boot bargain. He's bound to see a good return. it's packed full of bidders, all our owners are here with their antiques. Catherine, our expert, is here. -we'll get a profit today on everything. The man brandishing the gavel today is Andrew Smith. It wouldn't be Flog It without Clarice Cliff, would it? Thankfully, our two lovely sisters, Angela and Marilyn, have brought in a wonderful example. So who owns it? -She's not able to come, she's disabled. -Oh, she's watching at home. -Mum will get all the money? Ooh. It could be £300 to £500, were you surprised by the valuation? -James has done you proud. James knows his Clarice Cliff. I'm not a big fan of Clarice but I do know it fetches lots and lots of money. -And I hope this pattern is one of the better ones. -It's a nice shape bowl though; it's so big, isn't it? -The pointed ends are a little like a boat. So why are you flogging it, why's Mum flogging it? She doesn't use it any more, she's not able to use it any more. -The easiest thing to do is sell it as you can't divide that up? What would you do, James? so if it was mine, I'd sell it and buy something I like. Hopefully we'll get the top end of your estimate. OK, we're gonna find out now then, James. It's here. Good luck, everybody. Here we go. a lot of interest in this. so I'm going to start the bidding at £300. At £300 and selling... is there a 20? is there a telephone there? No. At £300 then, all done at £300. -Blink and you'll miss it. One opening bid of £300, James. it's Chitty Chitty Bang Bang. It reminds me of my childhood because I had one of these cars, it belongs to Caroline. -Who have you brought along here? Something you wouldn't want to inherit, is it? -nothing works, I chucked the box as soon as I had it. all the wheels have fallen off, but I've still got it. Yes, we've got the same. Yeah, yeah. And it's nowhere near worth as much as what we've got on this. -Hopefully we'll get the top end £150. -Ah this is mint, isn't it? Yes, it was my husband's. -Never really played with then, did he? -No, he never played with. -A present from his grandparents. -Just left it in the box. I would have had to get it out of the box and play with it. -He's a very restrained chap. -Oh, is he, right. OK, well good luck. Good luck, Susan, as well. It's going under the hammer now. Lot 780, Chitty Chitty Bang Bang, the Corgi model. 80 then, £80... Start with 50, £50. Thank you, and 5, at £50. Come on, we've got a bit of work to do here. at £65, at £65... any more? and 5, at £80 and we'll sell, at £80, are you done? Last time round at £80. -I think you're right, there's not that many toys there. -They haven't got the toys. It's the start, is it? -He's gradually going to sell? -You don't want cars, do you? so it's up to his colleague Nick Jarrett to sell the clock. My turn to be the expert, remember that lovely 8-day longcase clock, the oak one? It's about to go under the hammer, belongs to Keith, he's not here. He's on holiday in Turkey but we've got Keith's mum and dad here. -it was your Mum's, wasn't it? -Then it was yours, now it's Keith's. so the auctioneer can use a bit of discretion. If it sells at 560, you'll still get £500. Yes, yes. That'll be OK. Lot 840, the longcase clock at the back of the room. Now I'm starting you clear bids here at £500, 520 can I say? 560 on the phone, 580? At 560 on the phone, anybody else in? At £560... anybody going on at 560? I'll sell it for 560 if you're done. -I was right, wasn't I? -At least we don't have to take it home with us. -cos the more you move them, the more you damage them. there's £300 to spend on the restoration project, really. I think this is a real little gem, it's so cute to look at, isn't it? I wouldn't be selling it if I was you, Clive. and it's the least expensive item out of all our Flog It owners. We've got £50 to £70 on this. It's not a lot of money for something that's 100 years BC. and I can see this sitting on your bureau at home or something like that. It's got the look, you know what I mean. Paul, you know me too well. For me, this is one of the stars of the show, I love it. Fingers crossed we'll get a lot more than £70. -It's going under the hammer now. Good luck. Lot 440, this is an ancient unguent bottle. Start me at £50? -30 to get it going. 50, and 5... at £50, any more? At £50, are you sure? Last time, at £50 then. You've got a great eye, you found that in a car boot. Car boot sale for 50p. That's great profit, isn't it? I wish we could do that every single day. -so tactile and a beautiful shape, had so much character. Basingstoke isn't necessarily the first town in this country you think of, is it, let's face it. Britain's most enduring internationally-renowned designer labels. the ever-expanding railway system, Basingstoke started to thrive. moved here from Surrey, keen to set up his own business. and tap straight into the hearts of Edwardian society. who looks after the Burberry Collection for the Hampshire County Council Museum Service. So tell me a little bit more about Thomas Burberry. which was a thriving market town, and had opened up his own shop by 1856. The whole community would have been a farming area. and he was influenced by that. This is a standard agricultural worker's smock and this is where Burberry got his inspiration from. which you can see is very dense. which would have protected from the rain. -and thought that he could adapt the technology. You can see where the inspiration comes from. natural fibres to allow the body to breathe. was to proof the fabric and he did it twice. and he proofed the fabric again after it was finished. but he didn't patent the name gabardine until 1888.
couldn't have come along at a better time. British life was changing. and fields of game were an ideal magnet for the country sport set. And this, Paul, is an example of an early Burberry motoring coat. motorcycling or motoring and it's got the look. that there was so much interest in lots of other activities at that time. skiing, golfing, you name it. But the motoring coat was a huge, huge success. was that it was very lightweight, but it was still waterproof and windproof. -on a rainy day, you need it. -With the G-force pushing against you! -So by this period, how successful was Burberry? Hugely successful. Burberry expanded his empire enormously. and then he opened shops in Paris, Berlin, Buenos Aries, Montevideo, even New York. in one of the world's most extreme climates. of the Shackleton outrig suit. -the first man to reach the South Pole in 1911.
and it wasn't just the outfits. They also made the tents in the gabardine. to see Shackleton trudging across the ice in this. and Burberry gabardine was going everywhere in the world. it was just as useful in jungles and veldt. keeping them cool, in one case even protecting them from a tiger attack. It was keeping them safe as well. that Burberry would come up with his most famous design, the trench coat. and they came up with a variation of their existing raincoat, the Tielocken. which of course were used to attach kit. -that made it so popular with everybody. -And you could roll it up. where the theatre of war was, it was suitable. was class conscious and the officers were taken from the upper ranks. and there is a label saying that. Post war, it became a symbol of everything that's British. well removed from the field of battle but very, very stylish. original objectives of practicality and toughness. that's kept it at the forefront of fashion ever since. to see if our experts can find any classic pieces amongst our crowd at the Anvil. Johanna, what a lovely little box. Is this something you've had in the family for years? it was my grandmother's, but it may even go back further down the line. -That accent, that isn't a Hampshire accent, is it? -Whereabouts are you from originally? -No, I'm Dutch. I'm from Holland. OK, and on your father's side or mother's side, or both? Both, but from my father's side, they date back to Russia. Was it a style in Russia or...? it's not Russian, it's probably not Dutch. The most likely source for this is English. -So it's back home again. You've brought it back home. of the 19th century, right the way through until around 1850, 1860. So this little chap started containing tea almost 200 years ago. It's lined, if we open it up. and it's started to degrade over the years. So you wouldn't want to be scraping that up with your tea leaves today. It's veneered over the whole surface in mother of pearl. the important thing is to make sure there aren't too many pieces missing. where pieces have been off and on. So what do you think that little box will make at auction? No? Well, without the damage, it would obviously be a lot more. -I would think probably 250 to £350 in perfect condition. With the damage, 100 to £150, something like that. Now, would you like to put a reserve on it? You mentioned £200 to 250? -If it was perfect, 2 to 250. People remember the highest figures you tell them. -and just remember the figures. £100 - we'll do that. And I'll see you at the auction. Greta, Donald, thank you very much for coming today. this rather sweet and very small autograph book. Have you got any interesting autographs in there? Yes, I've got Laurel and Hardy. and there we are, we can see there's a wonderful picture of them there. of a rather plump Oliver Hardy and a very skinny Stan Laurel. and Oliver Hardy, which looks like to be in a little ballpoint pen. And they've signed underneath "Hello Greta," which is you. is what really interests me because there's more information on here. "Thanks for a nice hair trim, John. Oliver Hardy." And then at the top, you've got, "Me, too. Stan Laurel." Tell me a little bit about this. Where did you get this from? came to Dun Laoghaire and they stayed in the Royal Marine Hotel. so I said to him, "Oh, please, Daddy, get their autograph." -So he took it along. He cut their hair in the hotel. That must have been such a privilege to cut their hair. It was, absolutely. My father was very, very proud. Very proud. He said they were a wonderful couple. -I bet they were great fun as well. You must really treasure this. -My husband and I are retired. And what about you, Donald, are you a big fan of Oliver Hardy? Oh, yes, I've got some of his VHSs left at home. They were fantastic, weren't they? They were legends, even now. -You put them on and they still make you tickle. and perhaps putting a reserve on of about 350. I would hope that it makes more towards the top estimate. fetch really good money. They're fantastic. interesting than that, aren't they? Well, so I believe. I've been told that they may be Japanese. -They are, and do you know what they were used for? near the others because they're known as ojime. because, of course, in a kimono you don't have pockets. and that box is suspended by a cord. falling from the belt is a netsuke, which is often carved out of ivory or hardwood. is one of these little ojime, which are little beads to support the inro. some are dark patinated, some have got little silver flowers on them. appears to be a leaf with a crab crawling all over it. So they're all wonderful little individual works of art. There we've got a little frog on that one. Super, aren't they? to start clearing some junk out. Junk? Throw it my way because I think these are great. Were they all used as a necklace when you were a child? We used to string them together for something to do. And then in later years, my husband wore it to a fancy dress party. -What did he go as? 3 or £4 each up to 50 or £60 for a slightly more unusual one. £150 to £250 on them, reserve of £150. But if anything has the potential to fly at the auction, it's these. -I think they might do really, really well. Well, it's auction time again and here are our remaining lots. was English and I hope she's in for another surprise too today. of the silver screen, Laurel and Hardy. Will they achieve a legendary price? and James has high hopes for Janet's Japanese beads. but we're getting his reaction from Derby. I hope we get James' top end of the estimate, £150. Johanna, it's a gorgeous little thing. We're talking about the tea caddy. Probably you can remember James waxing lyrical over this at the valuation day. early Victorian, wonderful inlay, the condition's good as well. It's been a long day here and we need some good results. and those bits of veneer that are missing are expensive to repair. So, 100 to 150. Let's hope it makes towards the £200. If it does, then that's a great result. It's going under the hammer right now, good luck to both of you. Lot 810. This is a Victorian mother of pearl veneered single tea caddy. We have two commission bids here. I'll start the bidding at 130.
is there 140 in the room? 160 in the room, is there 170? At £160 and we are selling, at £160 if you're all done. For the last time, then. -Absolutely excellent, we got £160. With Christmas around the corner, well, more or less. -I think we spend that way. How would you say "good result" in Dutch? Sounds pretty similar - goede resultaat. Oh, it does actually, doesn't it? Remember the Laurel and Hardy autographs? It's time to put them under the hammer. We are joined by Catherine, Donald, and Bernadette. What a fabulous story we've just heard at the valuation day. Yes, absolutely. One of my favourites. Your father was a hairdresser? -He said they joked all the time. -but you didn't want to split the book up. -I'm pleased we've protected them with a reserve. Lots of memories and they're going under the hammer. signed by Stan Laurel and Oliver Hardy, so start me at £400. £400? make it 350, at £320. We are close at £320 but I'm afraid I can't sell at that figure. One bid away, we were one bid away. -We've got a reserve of £350. It's an absolutely cracking lot, a really super lot. just about to go under the hammer. That's a tongue twister, isn't it? and sort of as if you were. cos they're all from a dress? like the washer, under a netsuke. -And they were in a dressing-up box. Were they? Where did you find that? what you're looking at because I wouldn't know how to value these. Were you surprised at James' valuation? I had no idea what they'd be worth. I didn't even know what they were. it's quite an academic thing. How do you do it, James, how do you know about stuff like this? This is a really difficult subject. Loads of beads and a couple of them are signed. Those signatures could make all of the difference. so they might do really well. OK, I hope you're right. I hope we get the top end. We're gonna find out. It's packed here, so good luck, both of you. Lot 180. This is the Japanese beads. A lot of interest in these. We have four commission bids and a telephone. -I shall start the bidding at £450. James, it's exceeded your top estimate. -He said they might fly. At £720... Is there 750? At £720, then, for the very last time. Bang, that is a big sold sound. It'll pay for the piece of jewellery I've already commissioned. -You've designed a piece of jewellery? -And you're going to get it made. Oh, good for you. Good for you. at home, do what Janet's done. and hopefully James might be there to value it. here in Itchen Stoke just outside Winchester. to the auctioneer, and what a great day we've had. -See you next time on Flog It. 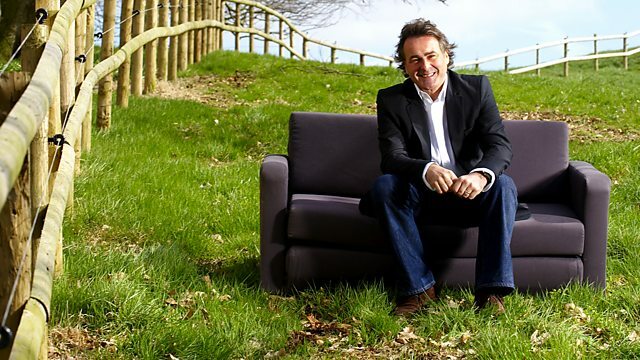 For more information about Flog It, including how the programme was made, visit the website at bbc.co.uk. The team are in Basingstoke, where James is delighted to find an ancient artefact dating from 100BC, making it the oldest item the show has ever seen. Catherine is blown away by autographs belonging to two of the greatest stars of the silver screen. And Paul finds out that thanks to the Edwardian obsession with the great outdoors, local tailor Thomas Burberry was able to establish the label that remains world famous today.